The Baptists, as a Protestant denomination, were established in England in the early 1600's. At Newton Abbot a chapel was built in 1697 and rebuilt in 1819. At Bovey Tracey their chapel was established in 1823 but another 27 years passed before a chapel was built here. 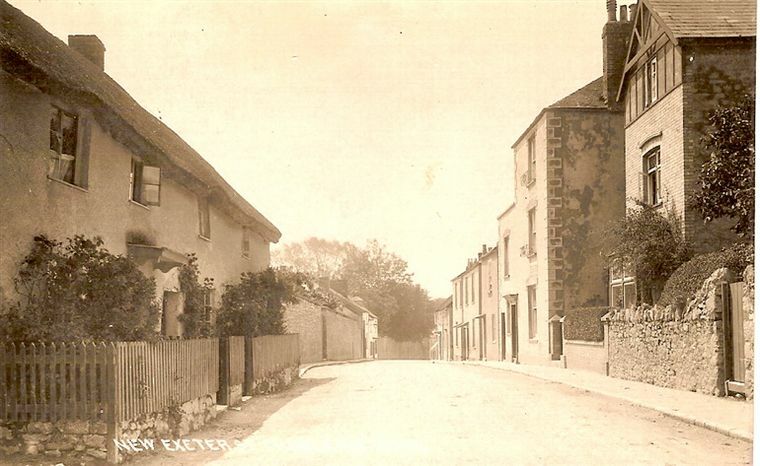 In those early days the Baptists were similar to the Congregationalists in that each chapel was independent, this was certainly the case in Chudleigh for many years until it joined the Devon Association of Baptist Churches in early 1887. Much more recently, in March 1977 the chapel amalgamated with those chapels at Bovey Tracey, Lustleigh and Moretonhampstead under the name of East Dartmoor Baptist Church. The catalyst for a Baptist presence at Chudleigh was the arrival of husband and wife William and Ellen Rouse who by 1841 were living at Coburg. They had moved in from Torquay although both were originally from Suffolk, having married at Woodbridge in 1830. In addition to the financial impetus from Mr and Mrs Rouse it was the death of Mrs Elizabeth Davison in 1847 that provided the land on which the chapel was to be built. Mrs Davison was the widow of minister James Davison who had been the pastor at the Congregational Chapel in the 1820s and 1830s. On her death she left a number monetary bequests and gifts of land, one of these being Fulford's Meadow on the Exeter Road, the express use of which was to construct a Baptist Chapel. One of her residential properties, Heathfield House, a little further along the Exeter Road became the minister's residence and the new home of William and Ellen Rouse. A meeting was held on 13 December 1848 at the British School rooms (the non-denominational schools set up by Mrs Rouse as an alternative to the church schools) to establish a Baptist Church. Chaired by Rev John Bigwood (the minister of the Bartholomew Baptist Chapel, Exeter) those present were 'formed into a Church' and comprised the following: William Rouse, Ellen Rouse, William Taylor, Mary Taylor, Samuel Causley, Mary Anne Babbage, Harriet Ferris, Susan Upham, Elizabeth Rottenbury, Patricia Truman, Mary Truman and Sarah Goodrich. Two absent members were also registered at that date, being Elizabeth Mudge and John Truman. It was resolved that William Rouse be the pastor and any person wishing to become a member should make application to the pastor who, if satisfied respecting their piety, would propose them to the Church who would accept or reject such applicant as they saw fit. The management of the affairs of the Church be vested in the Church and the election of Deacons be deferred until circumstances rendered it necessary. In the event William and Ellen Rouse were the principal benefactors until Deacons were first elected at a meeting of 28 October 1886 and from then on the financial affairs were overseen and run by them. 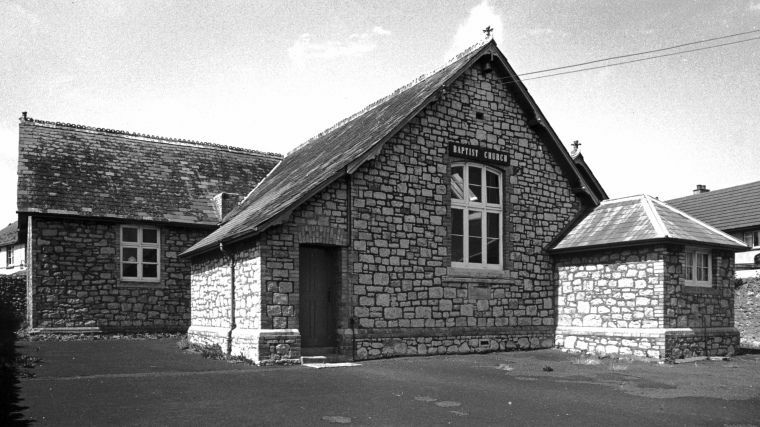 In the period 1849–1850 the original Baptist Chapel and adjoining Sunday schoolroom were built. The chapel was a large rather austere building and although designed for a large congregation, in the early days at least, it was rarely filled to capacity. The chapel was opened for services on 7 September 1850 and the Sunday school also started at about that date. The first musical instrument at the chapel was a harmonium which was replaced in 1912 by an organ purchased for £35 from the chapel at Stratford-on-Avon. This latter instrument served the chapel well and was still in use when the chapel finally closed in 1963. It was then sold to Messrs Osmonds of Taunton for £22. Mary Jones (History of Chudleigh, 1st edition 1852) wrote: 'Brookfield Chapel or the United Church of the Baptist persuasion was built near this town in 1850 by the generous efforts of W Rouse Esq. It is a neat and commodious building and presents a substantial and plain elevation; the interior is marked by the same regard to simplicity and comfort, the pulpit is a model of neatness, constructed, as also the seats of a kind of wood lately introduced into this country from New Zealand. There belongs to it a large and flourishing Sabbath school. The burying ground adjoins the chapel. The baptistery is at the residence of W Rouse Esq., who fills the pastoral office to this church. Boys, girls and infant day-schools are supported by the same generous individual, their duties being sustained by trained superintendents on the 'British System' under the able inspection of Mrs Rouse.' In her 1875 second edition she added that the interior of the chapel measured 57ft x 23ft and could seat up to 400 persons. By that year the building was lit by gas. In April 1852 'in consequence of bodily weakness' William Rouse found himself 'unable to conduct two full services on the Lord's Day in addition to his other labours during the week' and so their 'Brother' the Rev. William Doke took over as pastor. He was also the master of the Sunday School, having come to Chudleigh from Newton Abbot with his wife Eliza. For the first couple of years they stayed with Mr and Mrs Rouse at Heathfield Cottage moving to Rose Cottage (now Rosemount) in 1858. By 1866 and for about the next 10 years they lived at Laburnam Cottage, again in Old Exeter Street (today number 50). It was here that their two sons were born; William Henry (1860) and Joseph John (1861). This property remained in Baptist ownership until 1967 and was later known as Merley House. Following his wife's death in December 1877 he moved to Uplands, 69 New Exeter Street. Having served the ministry for 34 years he retired in 1886 and died three years later on 24 September 1889 aged 73 years. He was buried with his wife in the Baptist Burial Ground where a gravestone still exists. A memorial stone also exists to his two sons who were missionaries in Africa. The younger of the two, Joseph John Doke took over at Brookfield Chapel in 1886 and stayed until 1890.He then moved to the City Road Baptist Church in Bristol, from there he went to Australia and then on to South Africa where he died at Umtali aged 52 years. In 1884 the membership decided that although the chapel was most grateful for the ongoing benevolence of Mr and Mrs Rouse it should take steps to become self-funding. One of the first initiatives was the commencement of weekly offerings which would be used to cover incidental expenses. Twenty four members of the chapel participated in the first collection taken on 6 April 1884. In 1885 Mrs Rouse confirmed that she wished the chapel to be controlled by its members and to take on the responsibility of appointing future pastors. Rev Joseph Doke's replacement as pastor was the Rev Charles Stovell, born in London in 1839. He, as Rev Doke before him, lived at 'Uplands' in New Exeter Street. With him on census day 1891 was his wife Elizabeth (born 1845 Norwich) and their son, Spencer Stovell (born 1878 Lowestoft). 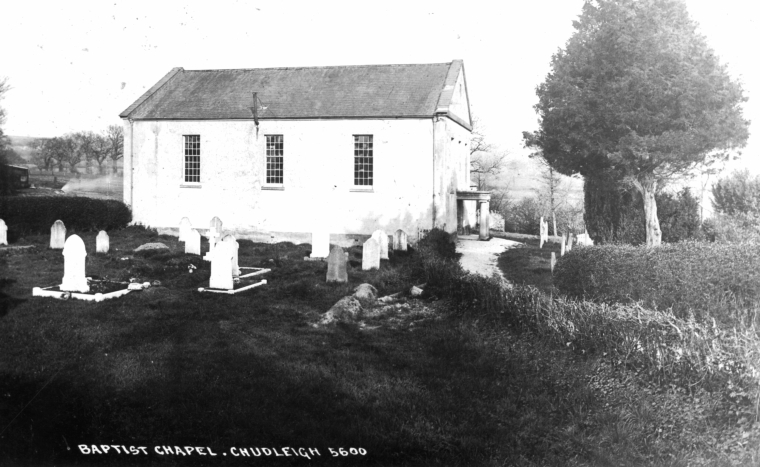 They left Chudleigh shortly following 1906. It was during his incumbency, in 1892, that William Rouse Esq the founding member of the chapel died. He had, up until a few years before his death, covered many expenses of the chapel which included an annual payment towards the pastor's salary. In his will left an annual endowment to the chapel. View showing 'Uplands', being the second house on the right, in about 1910.
these being Nos 5 and 6 New Exeter Street. Another regular income for the chapel from the 1860s was rental from 50 Old Exeter Street, in those days called Merley House. This remained in Baptist ownership right up until its sale in October 1967. From 1906 there was no settled minister for a few years until Rev Maurice F Hewett, originally of Bristol, but previously of Wellington who had taken up the post at the beginning of November 1911 and lived in Fore Street. The intervening years had been covered by a succession of visiting ministers and particularly in the summer months, student pastors. Rev Hewett stayed for four years moving to Dunnington in early June 1915. For a short period Mr John Peeke was the pastor in charge until April 1916 when Rev William Bonser took over. In June 1919 he was replaced by Rev W B Haynes of Croxton, Cambridge who stayed until 1921. Rev Frank Durbin filled the post for the next 17 years until his death in October 1938. It was during his incumbency that the chapel was first provided with an electricity supply in June 1927. As an additional source of revenue the chapel field was let from the 1940's and used by the Gill family for growing produce that was then sold in their Fore Street shop. For 1950–1957 Rev Noel Jenkins was pastor until replaced by Rev David G Harding. Two years later he was replaced by Rev A Loudon who moved to Ashby-de-la-Zouch on 17 October 1965. From January 1966 a local man, from Doddiscombsleigh, Frank G Cripps held office until June 1972 then moving to Longdown although he still held services until late 1975. His replacement at that time was G T Sansom. It is interesting to note that baptisms carried out by the Baptists involve total immersion and here at Chudleigh the Baptists were fortunate in that Bottle Brook flowed through their property and was put to use for that purpose. 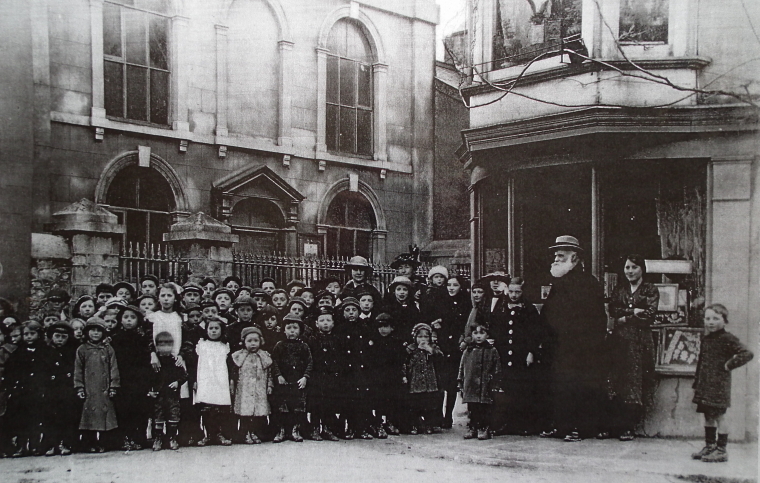 The original chapel in Exeter Road was sold by the Baptists in 1963, their chapel was then re-located to the top of New Exeter Street close to the junction of Colway Lane in part of the building that had previously housed their school until 1945 and was later used as a clinic. The 'new' Baptist Church photographed about 1965. The surviving records are silent as to the reason for the sale of the original chapel but it is likely that the expense of upkeep and lack of necessary finance played a part. Although no longer the owners of the original chapel the Baptists retained responsibility for the upkeep of the adjacent burial ground which remained in intermittent use until at least 1971. Throughout the later 1960's the old chapel building was the art workshop and studio facility of Mr and Mrs Justin Knowles who lived at Biddlecombe, having purchased that in 1966 when it had closed as a small catholic dame school. Following a 'mysterious' and devastating fire at the chapel in June 1973 that reduced the main building to a mere shell, the Chudleigh Cricket Club considered purchasing the site and ruin for £1000 to add more land to their site and for a new position at which to locate their new pavilion. In the event they did not purchase and their new pavilion was built almost on the site of the former one. The derelict remains of the chapel were purchased in 1977 by Mr R M Freestone, a builder and founder of the Launa Windows double-glazing company and over the next 6–8 years converted to residential accommodation. What was the chapel now contains a swimming pool and by the addition of an upper floor, space that was originally used as a games room. The main living accommodation was mainly a new build to the rear but did incorporate the original school room which now forms a lounge area. The Old Chapel as it was then known was put up for sale and changed hands in 1987 for £260,000. The building remains today as residential accommodation. From June 1999 the Old Chapel has been the residence of Mr John Rattlidge, he purchased from Mr Chris Huxford who in turn had followed Mr Mark R & Mrs Candida Kay. Mr Kay was the founder (1984) of Exeter-based building company Rokeagle Group which in 2001 as Rokeagle Ltd was acquired by ROK Building Group. (The Kay's were listed on 1994 Voter List as at The Old Chapel). The site of the original burial ground became part of the new driveway and parking area for the house and so a purpose built enclosure was created away from the main building and adjoining the Exeter Road. Some 33 memorial stones were saved and placed in this new enclosure. Additional information is available on the separate Baptist burial ground page. At the junction of Woodway and Old Exeter Street stands an imposing building that was formerly used as a dissenting chapel, firstly by the Presbyterians, then Congregationalists and much more recently, the United Reformed Church. This building dates from a rebuilding of 1830, replacing an earlier chapel of 1710. A place of worship had likely existed on or near this site since 1662 and can therefore claim to be the oldest established non-conformist meeting-place in Chudleigh, the Wesleyan Methodists not establishing their chapel until 1837 and the Baptists until 1850. The original meeting-house was first established for those who wished to follow the ethos of Presbyterianism which had emerged again following the Reformation, notably under John Calvin's influence. Presbyterianism advocated the independent principle which was also developed by the Congregationalists who in time took over the chapel. This independent principle meant that each church was self-governed and responsible for electing its own office-bearers and ministers, all of whom were treated equally in rank and function. In the year following the Civil War (1647) The Long Parliament set up the Presbyterian form of religion. Throughout the country clergymen were ejected from their livings and ministers elected by their parishes. In Chudleigh at this time was Rev Robert Wolcombe who seems to have been left undisturbed and who continued as vicar until his death on 19 January 1654. Rev Wolcombe's son John Wolcombe Gent (1604–1679) was the father of another Robert (born 1629 and baptised 7 October 1632). This Robert, like his grandfather and before him his great-grandfather, Bennett Wolcombe, became a clergyman, having been ordained at Dartmouth in 1657 shortly afterward he obtained the living at Moretonhampstead, on presentation by one of the Courtenay family. He had previously attended Oriel College, Oxford and matriculated on 22 November 1650. He gained BA 11 February 1652–3 and fellow 1654–5. He gained his MA on 4th December 1655. At Moretonhampstead he chose to follow non-conformity and it was been recorded that his father, John (son of the first Rev Robert Wolcombe) disinherited him and instead made his grandson (also called Robert) his heir. The will of John Wolcombe, proved on 11 April 1679 shows this to be the case although his son did act as Executor. At Moretonhampstead his incumbency was to last barely five years, he being ejected in 1662 because of his non-conformist views. He may have married at about this time or possibly after his spell in Exeter gaol (1665). His eldest three children were Robert, Joseph and Mary (their baptisms have yet to be traced). Five children were then baptised at Moreton, likely the children of his second wife Elizabeth. They were, Elizabeth (19/8/1675); Margaret (3/3/1677); Margery (16/6/1680); Henry (31/8/1682) and Jane (6/5/1687). Margery was buried on 29/7/1682 and Henry on 2/2/1684. This removal was likely as a result of the Five Mile Act of 1665 which prevented any minister from remaining within five miles of their previous living. The Presbyterian chapel in Cross Street (opposite the Morton almshouses) was said to have been founded by him in 1662 following the Act of Uniformity. It was later rebuilt on a different site in the same street by the Unitarians. Mary Jones (1852) says that Robert Wolcombe MA was a remarkable character. Presented to the living of Moreton by one of the Courtenay family and ordained at Dartmouth in 1657 (when aged 28). She then continues in the words of Edmund Calamy, the Noncomformist biographer, 'he was a hard student, a great philosopher, a sound, solid preacher, and a courageous advocate of non-conformity; for this he lost not only a good benefice; but a good estate, being ejected from his living in one thousand six hundred and sixty-two'. Mr Wolcombe, on his ejectment, was followed by a few of his hearers and became the founder of the Presbyterian Church at Moreton. He had, with his congregation to endure severe prosecution; he was by the Five-Mile-Act (1665), expelled from the town and on his return to visit his little flock was seized and committed to prison. His son Henery died at Moreton in 1683 and this may have prompted his return there. His will proved 21 May 1692 suggests that he married (for a second time) to Elizabeth in 1674 (26 Charles II) at which point he was 56 years old. The will mentions two sons Robert and Joseph and four daughters, Mary, Elizabeth, Margaret and Jane. It has been stated that his persecution lasted until 1687 when Mr Wolcombe and eleven others procured a license, dated at Whitehall signed Sunderland; for this a considerable sum was extorted. This license became useless almost immediately after, by the passing of the Toleration Act (1689): amidst all these conflicts and persecutions, Mr Wolcombe found a good conscience a continual feast, living contentedly and dying at peace in his house at Chudleigh in one thousand six hundred and ninety-two.' Interestingly the current Unitarian Chapel at Moretonhampstead is said to have been founded in 1692, is this a co-incidence? It seems Mr Wolcombe may have been imprisoned in St Thomas according to Quarter Sessions under James II. Thomas Major a soldier under Captain (or Major) Churchill was paid three pounds for apprehending a Mr Vincent, a non-conformist minister and Mr Robert Wolcombe, another minister, formerly beneficed at Moreton Hampstead, was committed for residing there, contrary to statute. The Justices were much disturbed by seditious libels, by burning such productions they were in fact destroying the principle evidence against the culprits. James Moor likely lived in what was later (1841) called Moors House in Pottery Lane (today Great Hill Farm) it adjoined Moors Meadow and the parish owned plot of ground that extended along the north side of the lane down to Broomsland Gate. The Congregationalists who later took over the chapel were also a self-governing Christian ecclesiastical organisation that had its roots in the published tracts of preacher Robert Browne (c1550–1633). Originally known as Independent the Congregationalists formed the backbone of Cromwell's army but were later persecuted under the 1662 Act of Uniformity. Although individual churches were self-governing this did not prevent them from forming associations for mutual support and in 1832 these numerous associations came together. On 22 May 1807 the chapel at the junction of what were then called Wood Way and Exeter Way suffered during the Great Fire of Chudleigh but not to the extent one might expect, being as it was surrounded by many cottages that were almost completely ruined. Crockett (1983) says that the only casualty in Wood Way was the Presbyterian Chapel but strangely it was not the outside fabric of the building that suffered, but the interior, which appears to have been more or less gutted or at least severely scorched. In the list of claimants following the fire is the entry 'Meeting House'. It shows that a total of £400 was claimed and that payment was made of that amount. On the 1838 Tithe Apportionment the chapel grounds extended to 0 acres 0 roods 9 poles. Rev James Davison is listed at an 'unnamed house' and occupying 11 acres 2 roods 20 perches, this was probably Heathfield House. A one acre field was also being rented by Commander Powney who was living at the adjacent property, then called Orizava and later Oakfield. Mrs Davison was likely Chudleigh born and had married the minister Rev James Davison, probably in Chudleigh. They were still in Chudleigh at the time of Victoria's Cornonation celebration (June 1838) but by 1841 were living at Heavitree in Exeter. He pre-deceased her, dying 5 August 1841 aged 60. They both have a memorial in what is now the Woodway Room and are both buried there. A Sunday school was established in 1816 and as stated by Mary Jones was the earliest in the town. Two of its earliest pupils were John and James Endicott who later were to become Moderators of the Church of Canada. The schooling facility was enlarged in 1912 and a hall and vestry were added at a cost of £700. A plaque inscribed 'C D Blake Esq September 5th 1912' may still be seen on the west wall of what is now the Chudleigh Pre-School room. Charles Davey Blake of Newton Abbot died in 1925 and amongst a number of bequests in his will was for the benefit of the chapel at Chudleigh. In the same year, 1912, a new organ was installed in the church. The Congregational Chapel in 1918. For many years the first two cottages in Woodway Street (immediately next to the chapel) belonged to the church and provided an income from the rental. By August 1939 however these cottages, like many others in the town, had been earmarked for demolition as insanitary following the 1936 Housing Act. The chapel arranged with a local builder to demolish them at no cost to the chapel and in return he could acquire and use the site as his yard. Today the space provides parking and additional access. 1901 At this year's census date there was no settled minister. At a house in Old Exeter Street lodging with a Mrs Shave was John William Davies aged 25, originally of Flint in Flintshire. He was described as a ministerial student (Congregational). 1902–1926 Rev Elijah Spry (died 1936, aged 81) He moved in to the town from Tetbury, Gloucestershire. On 22 May 1905 number 7 Old Exeter Street was dedicated as the Congregational Manse (more recently given the name 'Arne'). For some reason, rather than live at the Manse Rev Spry continued to live a little further up the road at 'Awdry' (1 Old Exeter Street). He was buried in the Roman Catholic part of the cemetery. His wife Mary, who died in 1941 is also recorded on the stone. 1947 The Congregational Church held its anniversary services. The local press reported that it was the 265th year. This takes the church back to 1662 which corresponds with the date that Rev Robert Wolcombe was ejected from the living of Moretonhampstead and is said to have established the Presbyterian form of worship in the town. 1953–1958 Rev Frederick E Moore. He was previously of Newquay, Cornwall and ex-RAF. His first service at Chudleigh was on Easter Sunday 1953. Rev Moore was very active in the community and wholeheartedly supported many local organisations, particularly the OAP Association. 1958–???? Rev Thomas Owen Jones. He was formerly of the Wylie group of churches based in Warminster. In May 1956 a memorial to those of the church that had fallen in both wars was unveiled in the church during a commemorative service by Major-General G T Cowan. Rev F E Moore conducted the service. The panel was made by Mr Jack Caunter. The memorial was taken down when the chapel closed and was stored at the Town Hall until March 2010 when it was affixed in the main entrance hall. It names fifty-two WW1 casualties and twenty-two from WW2. Note that the war memorial erected in The Square in 1926 contains sixty-one names for WW1, click here to see the transcribed listing for both world wars on the town memorial. Rev Moore and his wife left Chudleigh as a result of his transfer to the ministry at Chippenham in early July 1958. He was highly thought of in the town and the local newspaper records many instances of leaving gifts being presented to him and his wife on their departure. He was sorry to leave Chudleigh and said that a warm welcome would await any of his friends if they chose to visit Chippenham. For a short while until the next permanent replacement a number of short-term ministers were based at the church, Rev P R Pontefact and Rev S Tonkin to name but two. Rev Malliphant was the last Congregational minister to live at the Manse in Old Exeter Street. The manse was retained by the Congregationalists for a while after his departure and let, it was eventually sold. Following Rev Malliphant's departure the chapel came under the Kingsteignton circuit and the final two ministers were Rev. Joseph Cartwright and Rev. Eric Carless. Nationally, in 1972 the Congregationalists had merged with the Presbyterians and together formed the United Reformed Church. In Chudleigh the change took place in the following year and it was under this guise that the chapel finally closed. Generally it seems that the local worshippers were not particularly happy with the merger and this may have brought about the dwindling of their number. The buildings also became rather dilapidated as there were no funds available for the upkeep. In the latter part of the 1980s and into the early 1990s the chapel had shared use with the Catholics. Their Sunday services were taken by Rev. Levers who lived at the Redemptoristine convent. When he retired the Catholic services moved to the chapel at Ugbrooke where the services were taken by visiting monks from Buckfast Abbey. So it was that by 1992 all worship had ceased and the United Reformed Church offered the chapel and associated rooms for sale. Being adjacent to the Town Hall the idea came about at a town council meeting that purchase of the redundant building would make an ideal addition to the existing premises. Plans were first discussed in the November of 1993 to make a purchase at £52,000. Because of the remedial works required a loan was taken from the Public Works Board for £100,000. The chapel, the former schoolroom and burial ground all became part of the Town Hall complex during 1995 and the name Woodway Room was agreed upon for the chapel itself by the town council members. The small attached burial ground at the rear was last used in about 1890 and today twelve gravestones remain. As there had been no burials for 100 years and the ground was not consecrated there was no opposition to re-siting the gravestones to the west boundary wall and putting in a hard surface. This walled area now forms an ideal and enclosed play area for the pre-school children who also occupy the adjacent ex-Sunday school room. The main entrance to the chapel, via double doors off Woodway Street leads to a small vestibule from where stairs lead up to the gallery. The front elevation has large round-headed windows at the ground and first floor levels. On the outside a tablet above the central doorway records 'Founded 1710 – Rebuilt 1830'. The interior of the chapel is airy and lofty, having two tall round-headed windows on the west side. A tall window of the same dimensions as those opposite was formerly in the east wall but this has at some point been filled in. A large window is located at the south end but has been filled in with wooden panelling. There was a central aisle dividing the pews which were removed on sale. Both the Petherick and Davison inscriptions suggest that the burials were within the building as opposed to the adjoining burial ground and this has been verified by reference to the burial register held at the Devon Record Office. The Chudleigh war dead Roll of Honour used to be affixed to the south wall near the pulpit but was removed on closure of the chapel and despite remonstrations it remained within the Town Hall reception room until March 2010 when it was affixed in the public entrance hallway. Recent doorways have been created from the hall in the south and south-west walls to give direct access to the Town Hall complex and a small kitchen facility. The following is a list of burials (incomplete) for the Congregational Chapel. Some information has been extracted from existing gravestones still on site, the remainder from a register held at the Devon Record Office. Barnes William 1846 65 3 Mar 1846 Revd. Orchard Joel 1777 – – Revd. The Wesleyans took their name from their founder, John Wesley (1703–1791) who started this non-conformist denomination at Bristol in 1739. More usually known as Methodists this name first came about as a nickname for Wesley and his fellow under-graduates when at Oxford due to their strict adherence to a religious way of life. Following a period abroad Wesley, often with his brother Charles, then embarked on country-wide open air preaching which was to continue over the next 50 years. He ventured into Devon on many occasions but only met with real success at Plymouth. On a visit to Ashburton he commented 'many behaved with decency, but the rest with stupid rudeness as I have not seen for a long time in any part of England'. Following his death in 1791 forty six years were to pass before a Wesleyan Methodist chapel was established in Chudleigh through the sole benevolence of Miss Mary Jones. The authoress of 'A History of Chudleigh' (1852) she makes passing mention in her book of the chapel she founded. 'Situated in Mill Lane it was completed in 1837 and belongs to the Teignmouth circuit through which it is supplied by ministers and local preachers on the Conference plan'. On the 1838 Tithe Apportionment the property was occupying 0 acres 0 roods 3 poles. In her second revised edition (1875) she added that the chapel could accommodate almost 100 persons and was then on the Newton circuit. Miss Mary Jones was born in Chudleigh Knighton in 1797 and having travelled England extensively when young she came to Chudleigh in the 1830's and set about forming a Wesleyan chapel whose doctrines she strictly adhered to. At the 1841 census date she was living in The Square, approximately where the hardware shop is today. In her obituary, following her death on 25 April 1883 it was suggested that she was the mother of the tee-total movement in the town. The chapel was built wholly at her expense and toward the maintenance of it she gave much of her income (in the town she ran a china and glassware shop and also supported a small school) and it is likely that on her death she would have bequeathed a substantial sum for the ongoing benefit of the chapel. In July 1889 it was announced in the local newspaper that a new chapel was to be built on the site of the existing one and five months later the new chapel opened, the first service attracting a congregation of over 70 townsfolk. The newspaper reporting the opening also said that in excess of £200 had been spent on the rebuild. At this time a subscription was opened with a view to replacing the ageing organ and by May of the next year it was reported that a new 'American' organ had been installed. No burial ground was attached to the chapel, interrments took place at the churchyard until its closure in 1882 and from then on at the cemetery. In 1914 the chapel closed ending 74 years of Methodist worship in the town. Disused for some while it was taken on in 1930 by the Plymouth Brethren and used by them until the early 1990's. Following their departure and sale it was then converted for use as a private dwelling in 1995/96 by the local builder Mr Chris Cox. Mill Lane in which it is located was renamed Clifford Street and today the building can be found nestling between two cottages, numbered 48 and 49 Clifford Street. In 2007 the old chapel was for sale and a large feature appeared in the press on 14 June (WCS Library). The owner was Erica Tuck who had lived there for three years.